During Trustee comments at the DuPage Township Board of Trustees meeting on November 20, 2018, Trustee Benford closed her comments by asking that people pray for the victims of the shooting at Mercy Hospital. 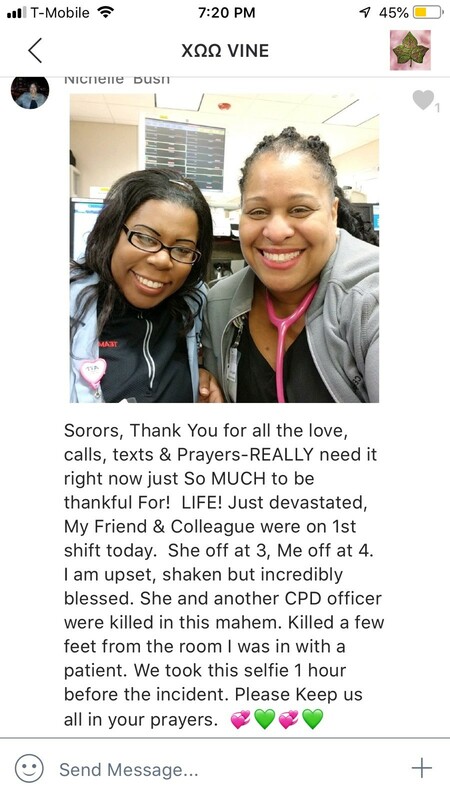 She stated that her sorority sister, Nichelle Payne Bush, had taken a picture with a shooting victim (Dr. Tara O’Neal) just an hour earlier, and she heard her being shot and killed in the next room. The quote from Nichelle Payne Bush was: “killed a few feet from the room I was in with a patient”. After the meeting, Trustee Burgess called it a false claim because the doctor was shot in the parking lot, said she lied about it, and called us several names before angrily storming out of the building. Several other women chimed in supporting Burgess’ statements and said we should report on the alleged lies. When questioned the woman had no proof to the claims being made and when one suggested we fact check their position by watching the news, I was advised to watch CNN by one woman, as if that was going to provide any such proof. We researched the issue and found Benford’s comments to be absolutely truthful and Burgess’ and others comment on the matter to be a shameful attempt at using a tragedy such as domestic violence and a mass shooting to malign truthful prayer requests. He and the other woman supporting his comments obviously did not research anything prior to commenting to us, and we suggest they provide proof to support their lies. Video of Trustee Benford’s comments below, and screenshots of Benford’s sorority sister’s account of the incident, which included hearing the shots fired (here and here), and stating that her co-worker, Dr. O’Neal, was killed in the parking lot just “a few feet” from the room, which we understand was next to the parking lot, where about 10 feet separated the shooting from where Bush was located. Even more concerning is the claims by the Supervisors wife that the comments from the trustee were nothing more than her grandstanding for attention. We found this situation to be an example of how low some people will go in order to defelct from the issue at hand, malfeasance by the Supervisor. Wasn’t Burgess the one posting on social media that now that the election is over, can they all get along? He obviously didn’t mean it. Isn’t he a veteran? A police officer was killed as well, four children lost their father, so why would he be offended that another trustee asked for prayers? He also made a statement about domestic violence the night of the meeting. When the cameras stop rolling, did he start making all of the other comments regarding Trustee Benford? I have to say I’m not surprised at Christine Mayer’s behavior. I still remember when she was speaking to one of the watchdog guys and basically it was “no big deal” that her husband illegally spent all of that money intended for the poor. She even said “yea illegal whatever”. If Burgess felt that way, he should have said it during the meeting while the cameras were rolling. Unbelievable, selfish and petty attack. i posted a link to a video that proves this is totally made up. It never appeared here. Maybe you should think about this or look it up for yourselves. It’s fake. Period. This website will not post any “false flag” information for any reason. Period. This wasn’t a fake video. Others witnessed this as it was streaming live on Facebook. Why do you think it was fake? She was talking about the shooting, not the meeting video. Just my opinion. The prayer was for those that are suffering, for those affected by a horrible tragedy and clearly from a sensitive, sincere, meaningful and thoughtful trustee. Just a warm thought of kindness. One that I appreciate. In this meeting, another message is shared: in the form of honest questions, issues and concerns. All relevant to the matters at hand and to the business of good government. Answers are warranted. We then find, the messenger is stonewalled, ignored, amd diminished by Supervisor Mayer, trustees Oliver and Burgess. They don’t address the message nor offer any answers to the questions. They want silence……………..and it shows. There must be a reason for that. Maybe it’s in the answers. I for one, would like to hear the answers. Offering prayer over a total psyop is nothing but Democrat grandstanding to pull on your heartstrings. You’ve been had if you fall for any of this. Watched the video online again. The only one grand standing was Trustee Oliver. She asked for a round of applause because the supervisor saved $100,000 but he couldn’t even answer any questions Trustee Benford had. I bet Oliver couldn’t either, just following that guy blindly. And if I followed correctly, Trustee Benford was explaining they could save a whole lot more if the didn’t put all that money in General Assistance again that the don’t need. I found it odd that no one could answer her questions. Isn’t the levy calculation something they do normally? She seemed to only be asking what the limits were. Why would an attorney or that other guy they hired to do the accounting not know that simple answer. How do you relay on their expertise? What are some of the requirements for the levy? I’m sure they read your articles, maybe they can learn from you . I don’t know why anyone would have a problem with offering prayers regarding this tragedy.